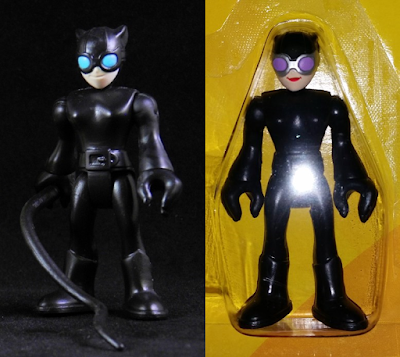 She's Fantastic: Imaginext Blind Bag - CATWOMAN! Imaginext Blind Bag - CATWOMAN! I love Imaginext so much. I really do. But I must admit they can be some of the hardest toys to find. The Target exclusive Cheetah and Sinestro set is impossibly scarce and the Batgirl figure disappeared from the shelves in a flash. As far as I can tell, this DC Super Friends blind bag series only ever appeared in UK grocery stores. I was trying to be patient, but I caved and ended up getting Catwoman from eBay. I hope they show up here in the States eventually because I would love some of the others (1st Appearance Batman is my jam). Plus that "Series 1" on the packaging fills me with a great hope for future waves. I both wish for this possibility and fear the frustrating toy hunts it will mean for me. But they're so cool and inexpensive that I'll still be on the hook for whatever they release. At the very least I think a Supergirl and Hawkgirl must be in our future, not to mention all the random non-licensed blind bag figures yet to be unveiled. I can't wait. Let's check out this purple-painted femme fatale below! This Catwoman doesn't come with her signature whip, but her freaky cat is included... luckily. Here she is with the first version from 2012. I thought I'd throw in this graphic I made many years ago showing the redeco from the Gotham City Center playset. NICE! I fear never finding these or the Cheetah/Sinestro set, but am not yet desperate enough to go the eBay route. She's gorgeous. I'm not a classic TV show Batman fan; I'm an Animated Series gal. But, I'm am rather fond of Catwoman in purple. She fits right in when lined up with the other Imaginext DC gals. Well the eBay route for Sinestro and Cheetah is prohibitively expensive. I think I got this figure for about $8 plus First Class International packet shipping. It was a splurge, but not any more than I would spend goign to the movies or something. Man, Imaginext stuff is tough to track down, right? I still haven't found a Batgirl for me or the little one and nothing from this series. No Batgirl for me either. Checking two different cities as well (in that I travel in between where I live and where my parents live semi-frequently). I've seen BAtgirl in Kohl's and then one brief weekend in early May they showed up in Target and Walmart here in Eastern PA. I saw them but never picked up any extras because i thought they would be showing up everywhere.